Primary care teams have become increasingly important in the management of patients with complex chronic care needs. 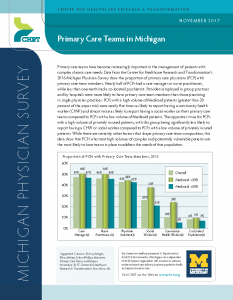 Data from the Center for Healthcare Research and Transformation’s 2016 Michigan Physician Survey show the proportion of primary care physicians (PCP) with primary care team members. Nearly half of PCPs had a care manager or nurse practitioner, while less than one-tenth had a co-located psychiatrist. Providers employed in group practices and by hospitals were more likely to have primary care team members than those practicing in single physician practices. PCPs with a high volume of Medicaid patients (greater than 30 percent of the payer mix) were nearly five times as likely to report having a community health worker (CHW) and almost twice as likely to report having a social worker on their primary care teams compared to PCPs with a low volume of Medicaid patients. The opposite is true for PCPs with a high volume of privately insured patients, with this group being significantly less likely to report having a CHW or social worker compared to PCPs with a low volume of privately insured patients. While there are certainly other factors that shape primary care team composition, this data show that PCPs who treat high volumes of complex and potentially vulnerable patients are the most likely to have teams in place to address the needs of that population.